(Nanowerk News) A novel strategy for engineering semiconductor materials can boost the performance of water-splitting solar cells for hydrogen production, according to a new study by researchers at the University of California, Santa Cruz. Using sunlight to split water into hydrogen and oxygen is potentially a clean and sustainable way to generate hydrogen for fuel-cell vehicles. Photovoltaic cells use solar energy to generate electricity, and electricity can be used to split water by electrolysis. But a more direct and efficient approach is provided by photoelectrochemical (PEC) cells, which use solar energy to generate hydrogen inside the cell itself. Graduate students Jennifer Hensel and Gongming Wang tested the performance of composite nanomaterials in PEC cells for hydrogen production. 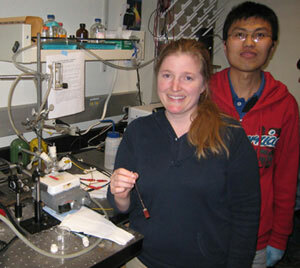 The UCSC researchers focused on the semiconductor material used as a light-absorbing anode in the PEC cell. They combined two techniques--called elemental doping and quantum dot sensitization--that have been used to improve the performance of metal oxide semiconductors in solar cells. These techniques use nanotechnology to manipulate the structure of a material on the scale of billionths of a meter. Previous work in the laboratory of Jin Zhang, professor of chemistry and biochemistry at UCSC, showed that this combination of techniques has a synergistic effect, markedly enhancing the performance of photovoltaic cells. In the new study, Zhang teamed up with Yat Li, assistant professor of chemistry and biochemistry, to test the same strategy in a PEC cell. "Elemental doping and quantum dot sensitization are two different techniques that work well by themselves. We found that we can combine them to get a synergistic effect," Li said. "We not only extended this idea nicely to a photoelectrochemical cell for hydrogen generation, we also proposed a new model to explain the observed experimental data." Zhang noted that more theoretical work is needed to fully understand the mechanisms involved. "Understanding the mechanisms will allow us to optimize the effects," he said. "The model we proposed in the first paper was very preliminary, but the new results have helped us refine our model." The researchers reported their findings in the journal Nano Letters in a paper posted online on January 25. Lead authors of the paper were Jennifer Hensel, a graduate student in Zhang's lab, and Gongming Wang, a graduate student in Li's lab. The researchers synthesized thin films of titanium dioxide nanoparticles, as well as titanium dioxide nanowire arrays vertically aligned in a thin film on a substrate. The titanium dioxide films were doped with nitrogen, and cadmium selenide nanoparticles were used for quantum dot sensitization. The resulting nanostructured composite materials were then used as photoanodes in a PEC cell to compare their performance in carefully controlled experiments. The results are an important demonstration of the potential to improve the performance of photoelectrochemical cells, as well as photovoltaic solar cells, using carefully designed materials, Zhang said. "The key is that combining different approaches in a rational manner can significantly boost performance," he said.